Stanley Fisher bravely gave a talk on labor productivity last week—bravely because Robert Solow was in the audience, which Fischer acknowledged as an honor, a joy, and something of a difficulty. In his talk Fischer touched on a number of possible measurement problems, but, like the majority of serious researchers on the topic we have quoted over the years, sees no reason to believe there has been an increase in any measurement bias, meaning the long standing decline in productivity is not a measurement problem. 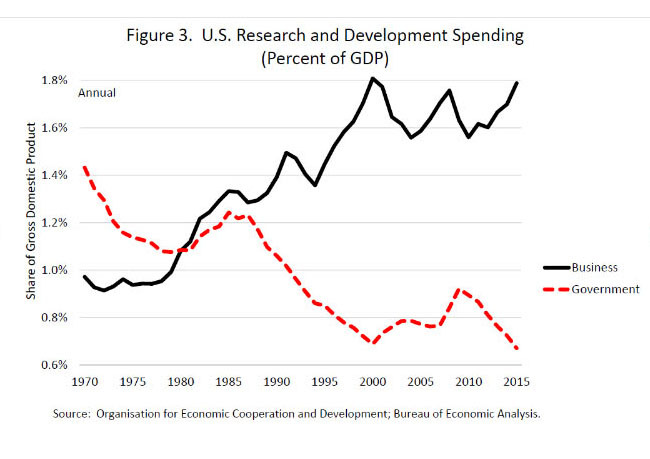 That’s why Fischer calls the stunning trend shown below disturbing. We’d add it may go a long way toward debunking the idea that there’s any mystery cloaking current weakness in productivity. John Fernald, researcher at the San Francisco Fed who has had tremendous influence on the Federal Reserve’s overall thinking on the issue, has shown that labor’s contribution to productivity, driven by gains in educational attainment, etc., has been stable in the periods shown on the graph below, which were derived from his team’s work on the subject. Investment has been a dragging factor, but the real culprit appears to be innovation, the residual tracked by Total Factor Productivity. Somewhat elusive by nature, it’s designed to measure changes in output that cannot be explained by labor and capital. Belief in the power of that component of TFP was the Kool-aid of belief in the New Economy, but the contributions of formal and informal R&D, better management, gains driven by government-provided infrastructure (there would be no farming west of the Mississippi without federal water projects), and the creative destruction wreaked by highly productive firms on the trailers are certainly real. While we’re not graphing this, Fernald’s research shows that productivity contributions from IT producing industries peaked between 1995-2000, the contribution of IT-intensive firms increased ten-fold between 2000 and 2004, and then shrunk back to where it had been by 2007. Non IT-intensive firms plucked their low-hanging fruit by 2007, and their contribution disappeared by 2011. Many of the revolutionary increases in productivity took place in retail and wholesale trade, and in online brokerage back then. Nothing comparable is happening now. Fischer believes that AI, his example is self-driving cars, medical technology (gene-driven treatments), and cheaper alternative fuels all suggest that we can reach for higher fruit, and raises the possibility that we may be in a productivity lull as these advances spread through the economy. He notes that it took decades for the steam-engine to make its changes. One hopes. And Fischer cuts to the chase. In answering his rhetorical what does this matter?, he turns to his favored measure: how long it takes for productivity and, therefore, income, to double. 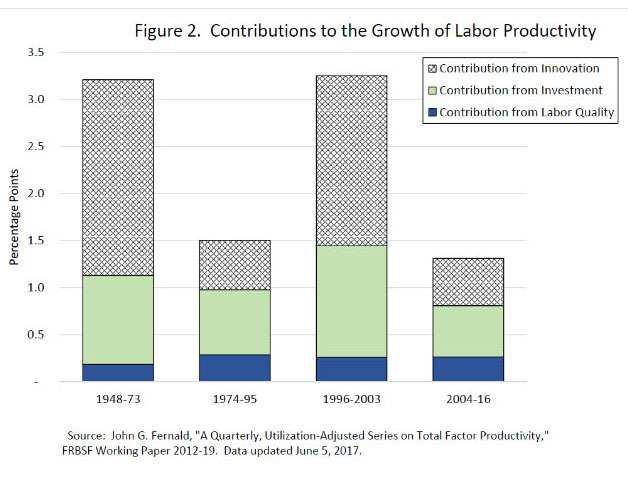 During the 25 years between 1948 and 1973 when labor productivity was growing at 3.25%, it took labor productivity 25 years to double (70/3.25); in the 42 years between 1974 and 2016, with labor productivity growing an average 1.75%, it took 41 years to double. What is the difference between the prospects facing the young when per capita incomes are doubling every 22 years and when they are doubling every 41 years. An excellent reason to work to shift the tide. Perhaps we could harness some creative destruction and dismantle our $125 billion-dollar-a-year Grid Lock industry. (Forbes noted about 56% of that is direct, wasted time and fuel while sitting in traffic.) It’s a far cry from what we hoped for from the innovation residual, but perhaps we should try to recoup the kind of productivity gains that came with the interstate highway system in the 1950s and 1960s—only maybe with some 21st century modes of transportation instead? Perhaps that’s something The Maestro might have thought he could do, but the members of the Federal Reserve are showing considerably more humility these days. When you read their words, it seems they are by and large trying to do their work, and in a stretch when possibilities formerly known as curiosities, like the Zero Lower Bound, hopped out of theoretical research papers and onto their plates. In a recent interview, David Beckworth asked St. Louis Federal Reserve Bank President James Bullard if, could they start all over again, members of the FOMC might consider nominal GDP or price level targeting instead of the current dual mandate of stable prices and hard-to-define full employment, Bullard’s careful response was, “I think…from just a theory basis, I think there is more sympathy than there would have been a few years ago,” and added we aren’t there yet. He himself is more sympathetic than he once was. A funny thing about the Phillips Curve: it’s been roundly questioned since it was knee high to a grasshopper. Just six years after A.W. Phillips laid it out, Milton Friedman and fellow monetarists pointed out various issues. To Friedman, it had a basic defect, the inability to distinguish between nominal and real wages, and held only in the short-run and when inflation and expectations were steady. The economics of the coming decades further tarnished the curve’s reputation. A bit simplistic but, of course, if the Phillips Curve were truly robust, there would be no such thing as stagflation; we’d be in a naturally correcting environment. Yet in the 1970s unemployment increased along with inflation, and in the 1990s unemployment and inflation fell together. The many other economic factors that affect pricing, including tight competition, supply shocks, a greater central bank presence, and changes in the make-up of the labor market, over-power the logical connection between low unemployment and inflation. “Deflating inflation expectations,” a recent study by Stephen Cecchetti, Michael Feroli, Peter Hooper, Anil Kashyap and Kermit Schoenholtz, suggests we should pay less attention to expectations and slack and focus instead on trend. They argue that while inflation expectations do correlate with the trend, it’s a misleading relationship because as inflation moves, expectations move with it. They point out that if inflation is moving at 2%, most will expect it will continue to do so, and will be right. They suggest instead we compare the change in inflation expectations to the change in inflation. That doesn’t work so well: changes in inflation expectations “tell us nothing” about changes in inflation. Since inflation is currently a bit below the Fed’s target, and long-term inflation closely follows the past few years’ average, they suggest the Fed will likely need to allow a short, modest overshoot to get us to 2%. But Bullard also points out that in 2012, when headline and core inflation were right on target, he thought the Fed’s “work was done,” but then inflation began to slip, which he has noted was happening again in the spring. That overshoot may prove elusive. Bullard suggests the core measure of PCE should be “thrown out.” First, he is not willing to go back to his constituents and say, “We stabilized prices, just not the ones you have to pay the most often.” Second, one of his colleagues looked into food prices and found that for some stretches they are the least volatile of all components. Bullard called it “kind of comical” that we’re throwing them out because they were so volatile in the 1970s. Third, core inflation “sunk a bit, maybe a couple of tenths on a y/y basis,” when energy prices fell in the 2014, and have since reversed course. That’s because there are core components that are heavily affected by movements in energy prices, so the effect is still in there. Bullard favors the Dallas Fed’s trimmed mean measure, running at 1.5% in May, but since so many models were built on core prices, he doesn’t think there is much will to recalibrate them all. We’d say this is not a good reason not to work to improve such an important measure, but it may be an overwhelming one. Perhaps that argues for nominal GDP, which washes out any issues with how inflation is forecast and tracked.